Like The Wiggles for Grown Ups: Reverend Peyton's Big Damn Band (WSG Bert Danger and the Flattops). The Big Damn Band--So Delicious! When my daughter was young. She loved The Wiggles on TV. And who wouldn't love a group of likeable, energetic musicians, singing simple, catchy songs about everyday life. My buddy has been talking about going to see Reverend Peyton's Big Damn Band for a year now. When I asked him, what kind of music they played, he was kind of at a loss for words and then said "They're like the Wiggles, but for grown ups!" After seeing them perform at the Machine Shop in Flint, I have to admit he was right...sort of. Comparing any band to a children's act could be construed as the ultimate insult, so let me explain. First, the good Reverend Peyton is an exceptional musician and one of the very best fingerstyle blues and slide guitar players I have ever seen. There is nothing childish about his music or his band. They are as talented and professional as any live band you will go see. However, part of their appeal is the stage persona they adopt, able to keep things straight-forward and simple so that the band and crowd alike are swept up in the good time. In this, they share a certain kinship with other great show bands like the Wiggles, the Blues Brothers and the Monkees. Let's get this straight, everything about their performance is designed to bring a grin to your face. 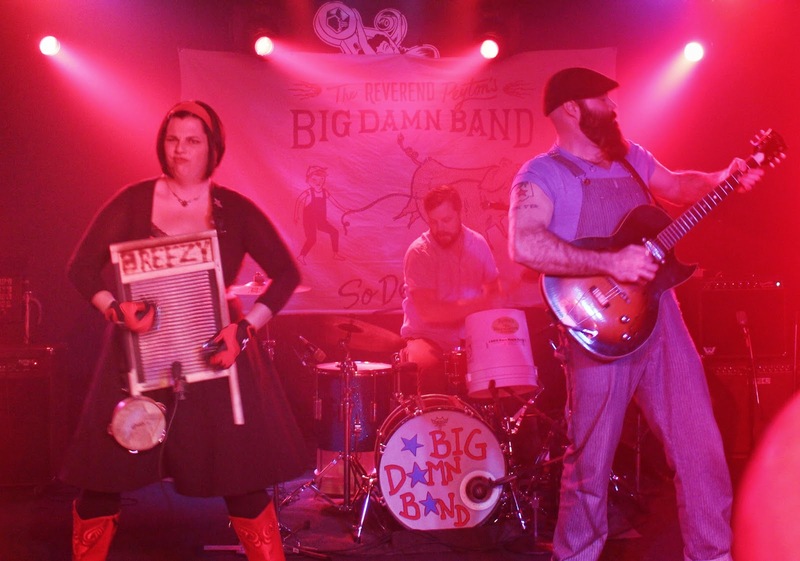 Even their name is part of the gag, with the "Big Damn Band" consisting of Peyton on guitar/vocals, with his wife Breezy on washboard and drummer Ben Bussell adding some backing vocals. It's a stripped down sound, yet amazingly complex. Part of this is undoubtedly due to Peyton's mastery of his instrument. Able to not only pick out the bass line while playing lead, he often incorporates a slide as well, and sometimes plays the bass, rhythm and lead lines all at the same time. Until you see it live, it is impossible to believe that he can create such a lavish and textured wall of sound from a single instrument. Coupled with his powerful baritone voice and driving, almost explosive, rhythms from the percussion section, the band turns every number into a toe-tapping, finger-snapping, get-up-on-your-feet-and-dance adventure for the band and audience alike. Like a scene from a dustbowl tent revival, the show started with the unfurling of the Big Damn Band banner behind the drum riser as the band sprinted onto stage, high fiving the fans in the front row. Peyton launched into the deep, dirty blues riffs of "Raise a Little Hell" and the crowd surged to their feet and rushed towards the stage. From there, the band launched into a high-velocity set of pure original music, changing tempos as often as Peyton changes his well-worn guitars. Whether playing his archtop electric for country-style blues, a open-tuned solid body electric for slide, a pair of resonator guitars for the delta sound or even a 3-string cigar box guitar just for fun, Reverend Peyton is a master of blues guitar. He plays primarily finger-style, with a thumb pick to really drive the bass rhythm. His overdriven tube-amp tone is spectacular and he uses few effects other than some overdrive. His songs feature strong walking or alternating bass lines coupled with melodic rhythm riffs and intricate melody lines. The band's newest album "So Delicious" debuted at number three on the Billboard Blues Charts and spend several weeks at number one. This self-taught axeman can surely play those blues! The Reverend spends the show cavorting on stage, moving fluidly between guitar-hero poses and grooving with the other members of the band. He likes to punctuate some of the songs by kicking over a sacrificial cymbal on the drum kit. The band even keeps a "gopher" on stage who's sole job seems to be standing that cymbal back upright. 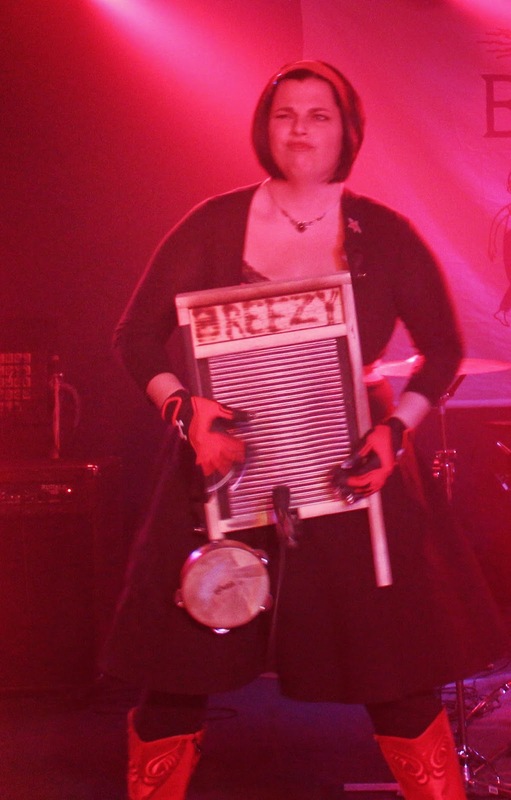 Adding some flavor to the mix is Breezy's vast array of winks, nods, smiles and suggestively raised eyebrows thrown in while playing some pretty complex rhythms on the wasboard (which she even sets on fire during the show). It is easy to see that she has a real connection to her husband's music and enjoys the time on stage as much as he does. She takes her playing serious as well. From the custom driving gloves outfitted with thimbles for added volume to a mounted tambourine her stripped down rig nonetheless allows her to create a variety of percussive and rhythmic sounds. From lightning quick left-hand strokes on the two and four count (like a mandolin chop) to slow clicking left-hand drags, she is able to create sound and rhythm that works with the drum kits, without competing with it. While here pure, high soprano voice works well with the Reverends, when she lets her voice slide down into her sultry deep register it adds a rich, bluesy feel to the songs. Drummer Ben Bussell is a lot of fun to watch. His approach is subtle, keeping the time and adding some drive without resorting to rock-star antics or "boom-chick" monotony so common in roots music drummers. He smiles ear to ear and displays a blistering array of "stick tricks" during the set. From the circus-themed graphic on the front of his kick drum, to his "interesting" choices in toms (yes...that's actually a pickle bucket...and it sounds great) it's easy to see he's here to have some fun. He has a fantastic light touch on the skins and some of the fastest hands I've seen. Together, the Reverend, Breezy and Ben are one of the most entertaining acts you'll find. However, when you look past the good times and schtick, there's one hell of a fine blues band in there as well! Warming up for the Reverend were Bert Danger and the Flat Heads, a cool little Rockabilly trio from Pinckney, Michigan. I can't imagine how hard it is to open for a showman like the Reverend, and I applaud them for sticking to their guns and working the music angle. That's not to say there wasn't some showmanship here as well, as Bert worked and amazing amount of the stage while playing his upright bass, and--when he switched to his electric--even got the crowd on their feet with a behind-the-back solo to one-up his guitar player. Didn't catch the other members of the band's names, but a KILLER guitar player on the strat (though I thought a tele would fit the band's sound better) covered a wide ranging set list of standards and deep cuts. I love that the band played covers but made them their own, changing keys, tempos and riffs to fit their own style. The crowd loved them too! What a great night of music! You might need to sit down for this, but I'm actually going to cover a 100% pure bluegrass band on this blog--and what a band they are! I've know the guys in Harbourtown for a few years now--they are somewhat of a fixture at most of the local bluegrass festivals I attend. Their camp always hosts one of the best all-hours jams; as if on a single-handed mission to keep the parking lot picking tradition alive. All the best pickers wind up there at some time during the night. I've been trying to catch one of their local shows for over a year, but somehow they always pick a busy weekend to make the trip to Southeast Michigan. A week or so back, I was FINALLY able to catch them on stage at the Kentuckians of Michigan Hall in Romulus. For those unfamiliar, this social/cultural club and hall is one of the top venues for live bluegrass in the region, hosting local and regional acts nearly every weekend. While some they have hosted some of the great names and legends in the genre, it's also a great place to catch new and upcoming bands. 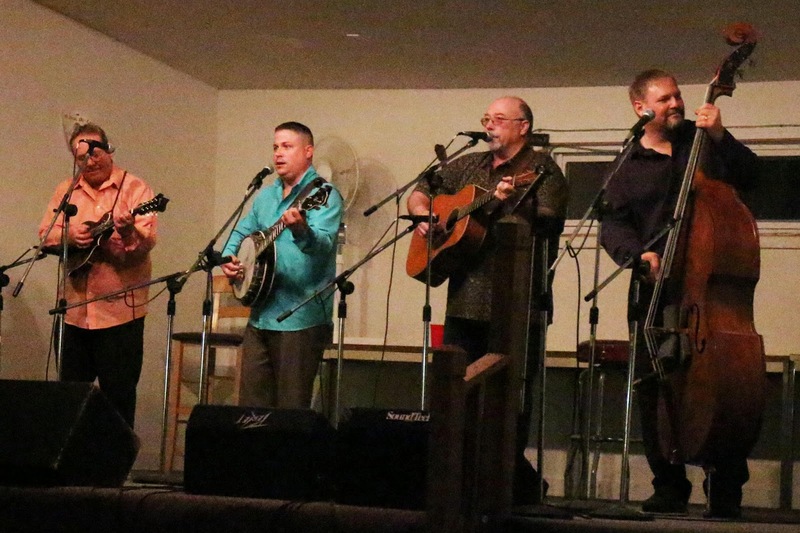 Harbourtown is about as traditional a bluegrass group as you'll find. They feature a straight forward lineup of mandolin, banjo, guitar and bass—each played by an accomplished musician equally at home playing lead or taking their turn with the solo breaks. All four members of the band sing—trading off the lead, tenor and baritone parts of a set list rich in bluegrass standard and deep cuts from first and second generation bluegrass bands. One thing is certain, they sing with all their heart and soul; belting out tunes at the top of their range and the top of their lungs. The band favors "high lonesome" standards and sings them as well as any band around today Theirs is an unmistakable sound that often draws enthusiastic hoots and hollers of appreciation from the audience. You’ll hear a lot of “brother” music from Harbourtown (you know, the Monroe Brothers, the Stanley Brothers, the Osborne Brothers…). Like many traditional bands, they deliver a mix of songs about the simple life and lost love and mixed with the occasional dark song/murder ballad done in a happy key/tempo. They also through in plenty of barn-burner instrumentals with booming banjo rolls, skillful mandolin breaks and flatpicked guitar breaks. The band has a great stage presence, easily filling the space between songs This is not your grandfather's bluegrass band however, as Harbourtown is comfortable filling out their set with a nice mix of more contemporary material tastefully selected from artists carrying on the bluegrass tradition. The set this night did not disappoint with a great selection of tunes, many of which I had not heard them play before. Great mix of slow songs early in the set building to higher-energy numbers to close things out. One particularly memorable moment came during a cover of Bluebonnet Lane, where guitarist John Coffey really hit his groove with a killer walking bass run on his old Martin guitar that boomed and resonated with near church organ richness--what a cool accent to a killer arrangement. I was excited to learn that Coffey had replaced former front-man Chris Smith, (who has taken a hiatus to concentrate on some other projects). It's always hard to replace someone as talented as Smith, but I can't imagine the band could have done better than Coffey. I first heard John play with his band “Pushin’ the Limits”, a great local band that sometimes features his young grandson Gavin on lead vocals and mini-guitar (you can find it on YouTube and it’s worth looking for). Coffey has an easy tenor voice perfect for those high lonesome songs; the sort of voice equally suited to lead and harmony singing; a voice with real character. John is also one of my favorite rhythm guitar players (though he is an accomplished flatpicker as well and fully capable of melting the occasional unsuspecting face). He has a subtle approach to rhythm relying on rock-solid tempo and a broad dynamic range to add color to his playing. He resists the too common urge to tack on a million extra notes, instead inserting subtle runs and fills the way a great poet uses punctuation. The true heart of the band is banjo player Jeremie Cole. A virtual juke box of classic bluegrass tunes, I swear he knows the kick-off and solo to every bluegrass tune written between 1940 and 1990. His rock-steady rolls provide drive in spades during barn-burner instrumentals and his sometimes bluesy, sometimes funky solo work can bring a tear to your eye or a smile to your face--and sometimes both at once! Jeremie sings loud. He obviously honed his trade singing in parking lot jams, surrounded by dozens of people and a million distractions. He also sings dead on pitch and rarely forgets or screws up a lyric. His voice is full, rich and loaded with gritty soul. It is hard to imagine the Harbourtown sound without both his signature vocals and infectious smile. There just aren’t many mandolinists like Lynn Fox. Like Cole, he sings with all his heart and his somewhat raspy, hard-edged tenor cuts through the full throttle Harbourtown vocals while at the same time adding a ton of intriguing texture and color to the mix. However, he really stands out for his mandolin work. He has an explosive, crisp chop with a full, woodsy tone. He throws in the occasional quick fill or melodic ornament to keep things interesting. He definitely gives everything to his singing—I have seen him at the end of a 3-day festival reduced to whispers and pointing by hours of singing. Fox has a great sense of melody and mirrors the vocals flawlessly during his breaks. He also has an uncanny knack for the dramatic, allowing his licks to grow in complexity and excitement, building to an inevitable smattering of applause as he finishes. Lynn is very workmanlike in his playing, with only a twinkle in his eye and quick smile betraying exactly how much fun he has doing it. A friend once told me that Kurt Hickman was the best bass player he’d ever met. I tend to agree. At first glance, you might disagree. Kurt plays a pretty straightforward “one-five” bass line with a few walks thrown in to change chords. He eschews taking numerous bass breaks, rarely resorts to slap-happy bass trickery and I don’t think he even owns a bow or electric bass. However, if you watch, some of his secrets are revealed. First, he does play a traditional bass line, but it is rarely the same song-to-song, and often verse-to-verse. He finds ways to play simple bass lines in interesting and complex ways. His timing is perfect…just teetering on the front edge of the beat the way I like it. He is a master of dynamic control, effortlessly blending into the groove—you often feel his bass more than hear it. He employs some jazz and swing walks as well as double stops in his transitions and has amazing tone. While fun-loving and quick with a joke, he is capable of connecting with an audience and filling the MC role in the band with a modicum of dignity and class. He somehow keeps the train on the tracks and rolling. The Kentuckians show had all the hallmarks of a late night jam at the “Cole Camp”. The band stood in the center belting out traditional bluegrass. There was food and drink aplenty. A loyal following of friends, family and followers showed up to show their support and, true to their parking lot roots, the band had several of them join them on stage. I’m sorry, I missed their names—they were exceptional! If someone sends me the info, I’ll edit it in here and give them the recognition they deserve. Like every time I see them, it ended too soon (and I regretted not bringing my guitar). Do yourself a favor, next time Harbourtown comes to town, go catch their show! Better yet, get your hind-end to a bluegrass festival (I recommend the Marshall Bluegrass Festival put on by Jeremie Cole), grab your axe and join in the jam. You’ll be glad you did!